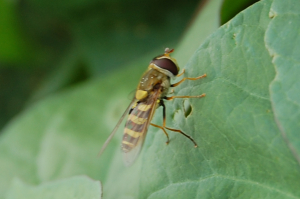 Observation - Syrphus Vitripennis - UK and Ireland. Description: Black femur, scuttelum is bright yellow, eyes are not hairy, stripes are curved. Black femur, scuttelum is bright yellow, eyes are not hairy, stripes are curved.